We are all born to die. Death may come at six or sixty. The fear of death should not deter us from struggling for our freedom", said Vellimalai (Gnanamuttu Krishnapillai) a candidate for the Tamil National Alliance, speaking at a campaign meeting in Kokkaddicholai, 16 kilometres southwest of Batticaloa Friday. 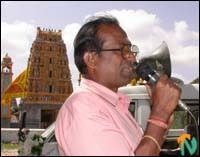 Six TNA candidates for Batticaloa, including Mr. Joseph Pararajasingham, spoke at the meeting. "If the Sri Lankan government does not begin talks with the Liberation Tigers in six months from coming to power, we will start a mass agitation in the north and east. 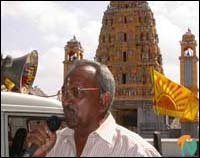 The Tamil people will achieve freedom only during Prabhaharan's time", Mr. Pararajasingham said. The TNA meeting was held in the foreground of the Kokkaddicholai Thaanthondreesvarar (Shiva) temple around noon. 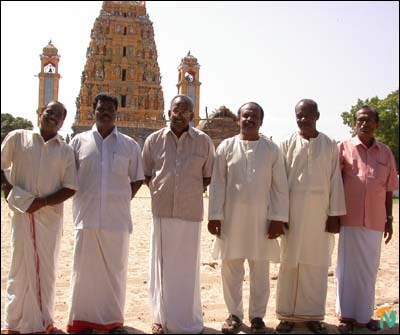 The original structure of the temple was built by Chola emperors in the 12th century A.D.
Later in the day, the TNA held a public meeting in the town of Kaluwanchikudi, 32 kilometres south of Batticaloa. More than a thousand people took part in the meeting.